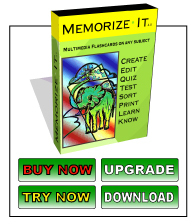 Memorize-It has a feature to test yourself with using same flashcards you study with. This is only with the multiple choice, true-false and type-in style cards, but it actually hides the answers and allows you to self test on the information you are studying. This feature was added as a precursor to a full blown network testing system. That system was available for a time and is back in development. Did you ever use flashcards?